That is seriously the cutest thing ever! My sister would love that, she is dog obsessed. 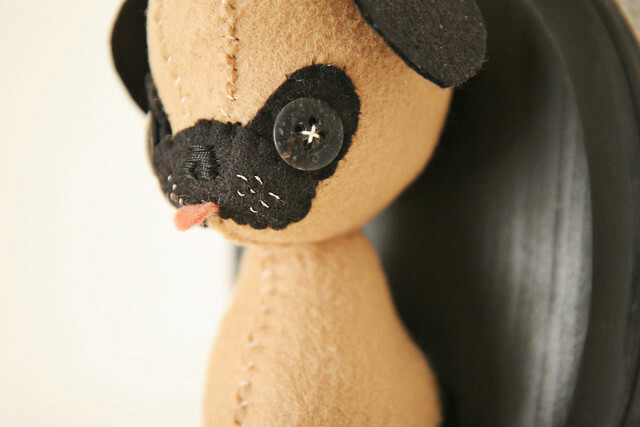 It´s so cute, I´d have loved it - lucky friend you have! :) That's very kind of you. I'm glad to know that other people get nervous about giving handmade gifts! I'm sure yours are always awesome. Oh my gosh! 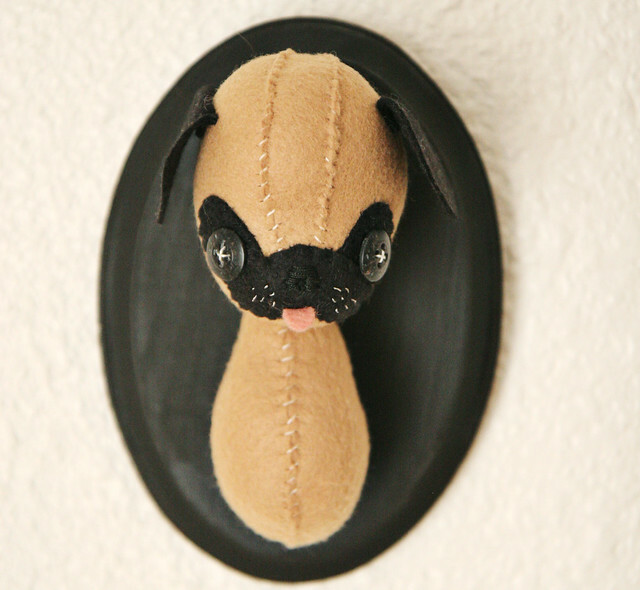 I feel like I need a pug wall now too! That is just the cutest thing! And I get so nervous with homemade gifts too! To the point that I usually buy a gift card to go with my homemade gifts. haha! I've never had anyone hate anything I've made them! But that fear will always be there! haha! I feel ya! Awesome pug! I'm dying of its adorableness! I know what you're talking about! It happens to me everytime too! That is just too cute & I know that she just loves it! I get the same feelings every time I give homemade gifts! This Christmas, I was just sweating bullets I was so nervous! OMG!!! I want one! Are you going to have these for sale? Let me know. I am obsessed with pugs obviously. This is adorable. I get nervous about homemade gifts every time, but mine are not nearly as precious as yours! Happy Birthday to your friend and Oh this is so cute!! She must have gone crazy over it! That is so sweet , especially his little nose and tongue! I worry about giving hand-made gifts too - will they appreciate the thought & effort, will they like it as much as I thought they might...so far so good though! This is so cute, I love it. I get really nervous about handmade gifts. I spend way too much time during the making stages worrying about if they are going to like it or not. This is fantastic! Could you a post a tutorial, i have a friend who would love this. This is so cute! :) I like how you make hand made gifts to your friends. I feel like it´s more personal that way! I saw this on Instagram - It's amazing! The little tongue is just SO cute! This is so cute!!! It is awesome when you can make homemade things for your friends. I saw this on Instagram, seriously, how are you so talented?? PS: Stop by my blog if you like vintage dresses, things with cats on them, thrift stores, flower crowns, and crocheted bows. Giveaway happening now! Thats histerical. Who wouldnt love that? Btw, I have the same thing with giving handmade gifts. Even though usually ppl seem to love them, but still... I worry every time. Love this Katie. It does say Emma all over it :) Wish I had creative friends like you guys too. I feel the same when giving handmade presents though, the 'will they like it' pressure is definitely always there! it is so cute! And I love reading that you still get nervous about giving handmade gifts--I thought this was something that just happened to me because I am fairly new at it. It's a weird vulnerability, but how could someone not love what you put time and effort and love into? Especially your stuff, lady. Are you crazy? I LOVED it! That is so cute! I have two pugs of my own. I totally know what you mean about that feeling... but I know for sure that anyone receiving a gift from *you* will absolutely adore whatever you make them! Sooo cute! There is a woman who makes all sorts of animals just like this her site and store name is called Stitch of Whimsy, if you google her you'll see many different kinds! This is one of the cutest things I've ever seen! My fiance and I plan to get a pug after our wedding this June! Will you be selling them in your shop? I'd love to own one! 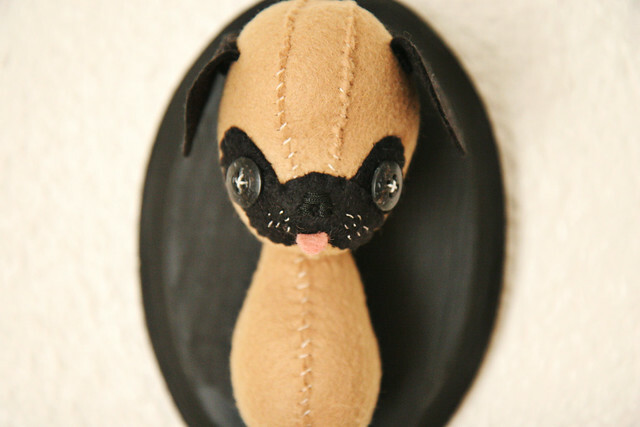 I saw this little guy appear on Emma's blog - I'm obsessed! He is so adorable! Great job! You have interpreted the whiskers really well, and I really like the way you set your little creatures eyes low; It makes them look really soulful. I WANT! But really, how adorable and impressive. How could she not love it?? It's personal, handmade by someone she loves, and fits into what she likes. The very best gifts. Good job. I love it.